What is the future of technology in education? A couple of weeks ago I was asked what I thought the future of technology in education was. It is a really interesting question and one that I am required to think about all the time. By its very nature, technology changes at a fast pace and making it accessible to pupils, teachers and other stakeholders is an ongoing challenge. So what is the future? Is it the iPad? No, I don't think it is. For me, the future is not about one specific device. Don't get me wrong, I love the iPad. In fact, I have just finished a trial to see if using them really does support teaching and learning – and they have proved effective. I've written about the trial in more detail on my blog. iPads and other mobile technology are the 'now'. Although, they will play a part in the future, four years ago the iPad didn't even exist. We don't know what will be the current technology in another four. Perhaps it will be wearable devices such as Google Glass, although I suspect that tablets will still be used in education. The future is about access, anywhere learning and collaboration, both locally and globally. Teaching and learning is going to be social. Schools of the future could have a traditional cohort of students, as well as online only students who live across the country or even the world. Things are already starting to move this way with the emergence of massive open online courses (MOOCs). 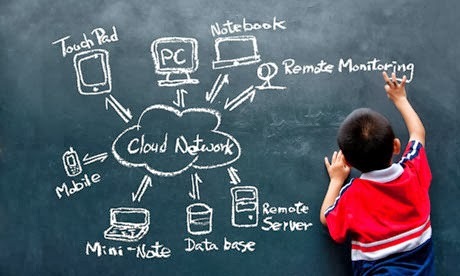 For me the future of technology in education is the cloud. Technology can often be a barrier to teaching and learning. I think the cloud will go a long way to removing this barrier. Why? By removing the number of things that can go wrong. Schools, will only need one major thing to be prepared for the future. They will not need software installed, servers or local file storage. Schools will need a fast robust internet connection. Infrastructure is paramount to the the future of technology in education. We don't know what the new 'in' device will be in the future. What we do know, is that it will need the cloud. Schools and other educational institutions will need to futureproof their infrastructure the best they can. This should be happening now. If you want to start to use mobile technology in your school, whether it is an iPad program or a bring your own device (BYOD) program your connectivity must be fast and reliable. Student and teacher buy in, is so important. If the network is slow and things are not working properly students and teachers will not want to use the devices. Make the sure the infrastructure is there before the devices. Teachers can use the cloud to set, collect and grade work online. Students will have instant access to grades, comments and work via a computer, smartphone or tablet. Many schools are already doing this. Plus, services such as the educational social network Edmodo offer this for free. This is where devices come in. All devices, not matter which ones we will use in the future will need to access the cloud. Each student will have their own. Either a device specified by the school or one they have chosen to bring in themselves. School classrooms are going to change. Thanks to the cloud and mobile devices, technology will be integrated into every part of school. In fact, it won't just be the classrooms that will change. Games fields, gyms and school trips will all change. Whether offsite or on site the school, teachers, students and support staff will all be connected. In my ideal world, all classrooms will be paperless. With the cloud, the world will be our classroom. E-learning will change teaching and learning. Students can learn from anywhere and teachers can teach from anywhere. The cloud can also encourage independent learning. Teachers could adopt a flipped classroom approach more often. Students will take ownership of their own learning. Teachers can put resources for students online for students to use. These could be videos, documents, audio podcasts or interactive images. All of these resources can be accessed via a student's computer, smartphone or tablet. As long as they have an internet connection either via Wifi, 3G or 4G they are good to go. Rather than being 'taught' students can learn independently and in their own way. There is also a massive amount of resources online that students can find and use themselves, without the help of the teacher. This of course means the role of the teacher will change. Shared applications and documents on the cloud, such as Google Apps will allow for more social lessons. How often do students get an opportunity to collaborate productively using technology in the classroom? It isn't always easy. However, students working on documents together using Google Apps is easy. They could be in the same room or in different countries. These are all good skills for students to have. Of course, these collaborative tools are also very useful for teachers. I for one have worked on several projects where these tools have lets me work with people across the country. Some of which I have never met. What we must remember is that when schools adopt new technology and services, they must be evaluated. This way, as a school, you know if they are successful and what improvements are needed. Staff will also need training, you can't expect staff to use new technology if it they are not confident users or creators. Any initiative is doomed to failure without well trained, confident staff who can see how technology can support and benefit teaching and learning. Plenty of schools have already embraced this, but there's still a way to go to ensure all schools are ready for the future of technology. It is time for all schools to embrace the cloud. Matt is head of ICT at Kingston Grammar School and the director of education consultancy Realise Learning. He blogs here and you can follow him on Twitter: @mattbritland.